That’s actually only 17 books, so technically I still need three more. That’s about 5200 pages for me to read, so if I average 100 pages a day I should be just fine. No problem, right? We’ll see. P.S. I *did* re-read 7 books at various points this year. So even though I won’t re-rate them on Goodreads, if I get through 13 of these books I’m totally counting that as hitting my goal. Even though I really wanted to read 50 NEW books. I had set a goal to read 24 books this year. I figured 2 a month should be easy plus that was the number of books on my shelf to be read. I have read 10 with 4 of those being in the last month. I don’t think I am going to make it. It seems so reasonable when you have the whole year ahead! You can do it! I know how you read. You could read 100 pages while tuning out my “Kari problems.” 😉 I’ve always been jealous of your skills. If only reading were a marketable skill! I think I have read 9 books this year??? 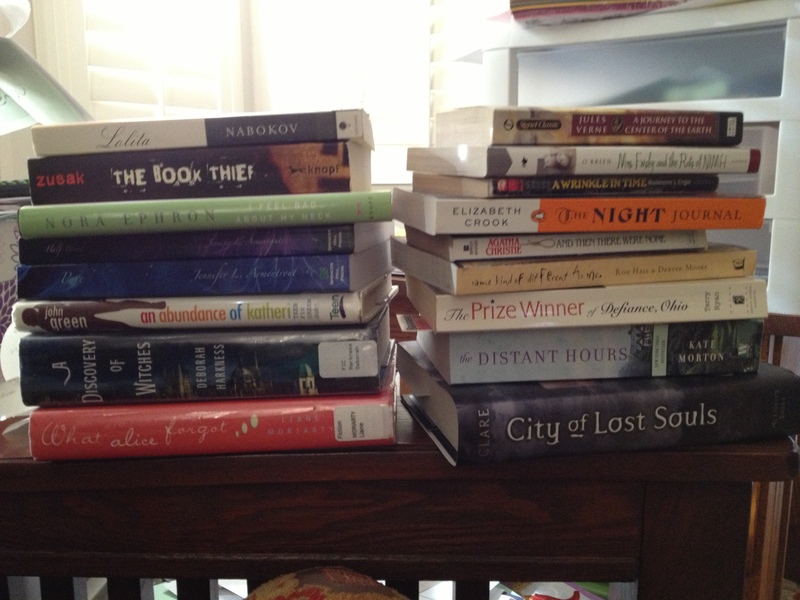 It would be hard to manage more, I love reading though. I took a 10 year break reading for pleasure starting about my freshman year at Mines… I was very anti e-reader, but ever since I got my Nook I read much more. I love reading, my problem is I ignore everything else when I get involved in a book. So I have to limit myself. 100 pages a day… You’re ridiculous. I’m on track so far! With that many books left to read perhaps you should cut some corners and consider buying (or checking out) 20 new and interesting childrens books, and just read those to your kids. Totally counts! Oh, I thought about it. Luckily, if it comes down to that I can do it in like a day. Looooved The Distant Hours (devoured all of Kate Mortons books one after the other). But The Forgotten Garden is by far her best! If you haven’t started DH yet, you should consider switching…you won’t regret it! Oh, I’ve already read Forgotten Garden and I loved it! That’s why Distant Hours is in there.